In an attempt to find interesting photographic subjects during a sunny spell in what was otherwise a dull and dreary UK winter, I ventured into the local park. I didn’t find much of interest, as although it was a sunny day, the intensity of the wintry light meant weak shadows. Fortunately, as I always do, I looked up and spotted this one leaf hanging on, just waiting for me to come along and take its photo! 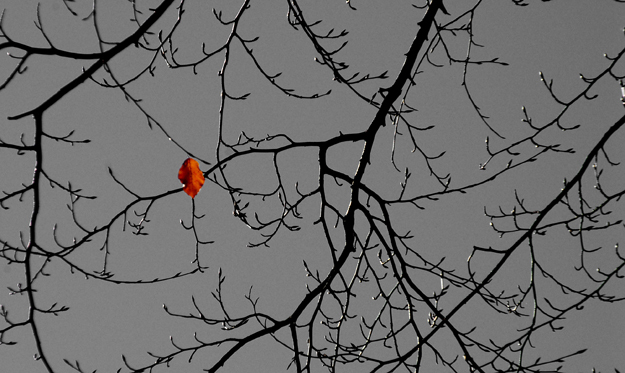 This entry was posted in abstract, Art, Digital Art, photography and tagged autumn, fall, leaf. Bookmark the permalink. ← Grab it while you can!